While working on some of my little redesigns, I thought, hmmmmmm, it's been a while since I've had a giveaway. Sooooo, how about a quickie giveaway from me to you. I'm calling this a quickie giveaway because it'll close in 3 days. Everything here is handmade, or redesigned by me. Just a little something to say how much I appreciate all of you. Two little script covered boxes with rusty metal crown stamped lid. Great for trinkets. One of my little handmade, and painted salvaged metal crowns. Could be used on a doll, statue, or simply displayed. 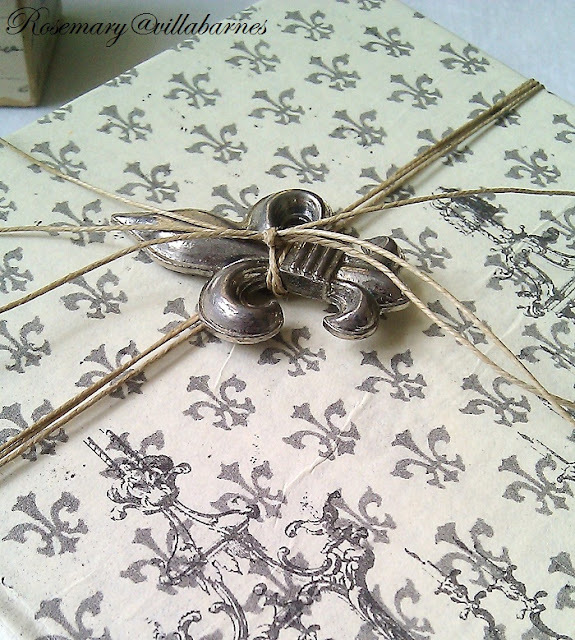 A vintage book I covered with a fleur-de-lis and chandelier design of mine. There's a musical touch on the back. 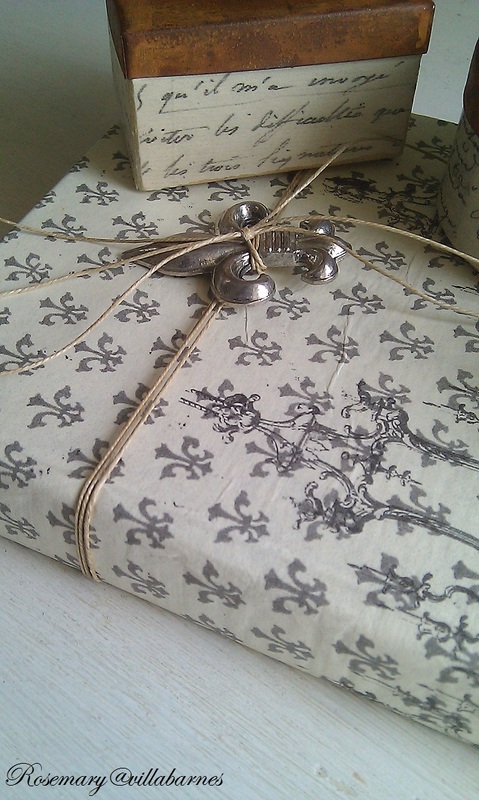 The book is wrapped in twine, and I've added one of my metal fleur-de-lis for a little bling. ohmygosh!!! Been awhile since I have been on your blog. Today I peek and you are doing a give away! The book is beautiful! I am already a follower :-) Have been for some months. And yes please... enter me to win all the pretties! Oh me, me, me!! I am already a follower! I would love a chance to win all of your pretties!! Thanks for the give a way!! Beautiful Rosemary and yes I am a follower! I am lucky to have purchased one of your beautiful tiara's! Of course I'm a follower, but too far away for a giveaway. They are very pretty pieces though, so good luck everyone. I just found your beautiful blog, and I am your newest follower. Absolutely lovely giveaway! I've been a follower for a while now. Please consider me entered into your generous and lovely giveaway! I'm a FOLLOWER! Love this! Would look so chic in my houze somewhere!!! I'd love a chance to be the lucky winner. Beautiful treasures Rosemary. I'm already a follower. I am a follower and would love to enter Rosemary. ADORE all your goodies!! Please count me in.. I have followed you for sometime. I would so enjoy this. Especially the crown. I will be looking at your etsy site next. Love being a follower and love this amazing giveaway!! I have been following you for two weeks now and have tried some of your projects.YOU are inspiring me to get creative....just joined. yes, i am already your follower and i would just love to win this lovely giveaway! Well, the most recent were the wood books and the little crown. I am a follower! I would like to be entered in the drawing. Thanks for the opportunity!! Your items are so pretty! I would love to be entered in your giveaway. Have been following your blog for months, but today I am officially a follower. Really enjoy the inspiring posts!! I am a follower, but before that I was an Etsy customer. I bought your clay angel wings and LOVE them. Thanks for the give away offer...would so treasure your treasures!!! I'm already a follower, Rosemary. What a great give away. Count me in. Oh how beautiful! Please pick me! :). I've been following a short while and am getting to know you. I like what I see! Of course I am a follower & I would Love to be entered! Love your items. I am a follower for some time. Count me in your great giveaway. Thank you for the chance to one some of your great items. You didn't say if we Canadians can enter. I'd love to have one of your creations and, of course, I'm one of your follower fans! I love following your beautiful blog, and would so love to win your generous giveaway. I'm a new follower but not new to your blog. I've pinned many items that link to your blog. You've created many beautiful items and I hope I'm the lucky one to receive this generous offering. Please enter me for your giveaway!! I love your blg and check it almost every day!!! I just subscribed to follow you via email. Thank you so much!! Please enter me in the giveaway! I have been a follower for a while now, you are so talented! Thank you for the chance to win some of your wonderful creations! You are such an inspiration to me!! since seeing your gesso work I have incorporated a similar technique to my matchboxes I sell!! they are beautiful just as all of your ideas...I am new to this mode of communication .....but have visited your site mannnny times!! I am so inspired by your work!! 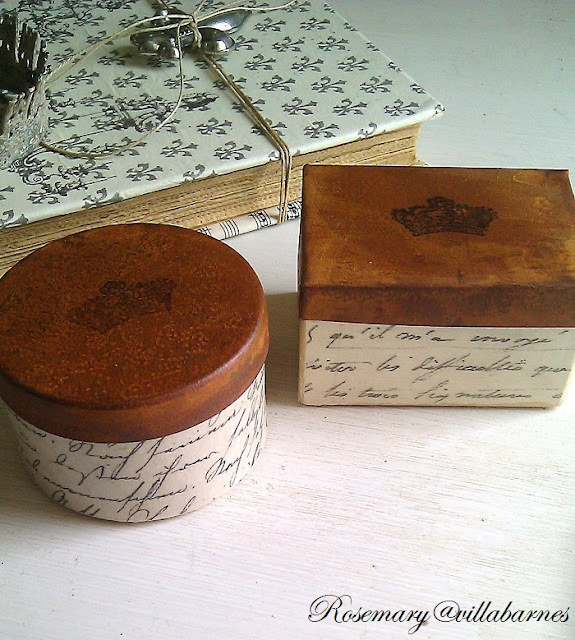 After seeing your gesso work I have incorporated a similar concept on my matchboxes I sell and they are beautiful!! thanks for sharing all your secrets...I am a new follower and new to this mode of communication.. thanks for the chance to win. You are too sweet. I follow. I am a follower and I am thrilled to be entering your giveaway, thank you! love you bunches, I'm such a follower!! also love my clay tags and ornies that I bought from your Etsy shop last Christmas! I am a brand new follower of you here at your blog....just love your creations! I requested to follow on facebook & followed you as well on twitter! Just joined your blog! love the giveaway! Oh!!! I hope I win. I am the Cynthia that bought the mirror from you and I am a follower as you know. Of course I'm a follower!!!! Please throw my name into the hat! I really like your blog and your work, I'm here to follow you. I'm already a follower, Rosemary and I'd love to win your giveaway. please enter me and i'll keep my fingers crossed until winner is announced. 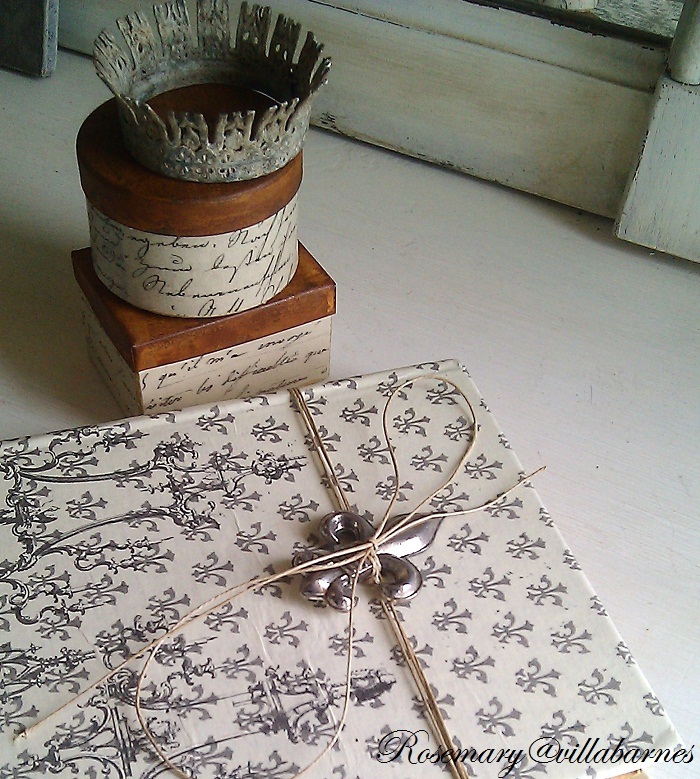 those pretty boxes with script would look perfect on my dresser. Hi Rosemary, I have been following your blog for quite some time now. Please enter me for this great giveaway! Love your creations. I did buy some old hinges from your shop. Good luck to me. Would love to have the trinket boxes. So nice. I would like to enter the draw. I love your work, and I follow by email. I was lucky to find you and am constantly inspired by your creative talent and sharing ideas. Having a drawing is such a treat and all of the items are just to die for. I follow you by email. I follow you by GFC and Email and I want this prize! I follow you by email and would adore your beautiful items. I've purchased some of your fleur de lis tags! Every thing you do is gorgeous! Great giveaway Rosemary...have a wonderful weekend! Hi Rosemary, I am one of your followers, I get your blog posts in my email. They are always inspiring, I would love to win one of your handmade gifts. Oooh I would love to be counted into your lovely giveaway...you know I'm a die hard follower! Thanks for the chance! I'm also a customer of yours as well as a loyal follower...thanks for the chance to bring home more of your beautiful goodies! Dear Rosemary, I am also one of your devoted followers. Your creativity blows me away! I LOVE everything you make!! Please include me in your fabulous giveaway, and never quit inspiring people like me. Thanks!!! Already a follower - love your posts, and photos - great ideas - would LOVE< LOVE< LOVE to win your give-away! Beautiful things!I have been a follower for awhile now! Thanks for the chance! I have followed you for the past 2 years. Love your items and your techniques! 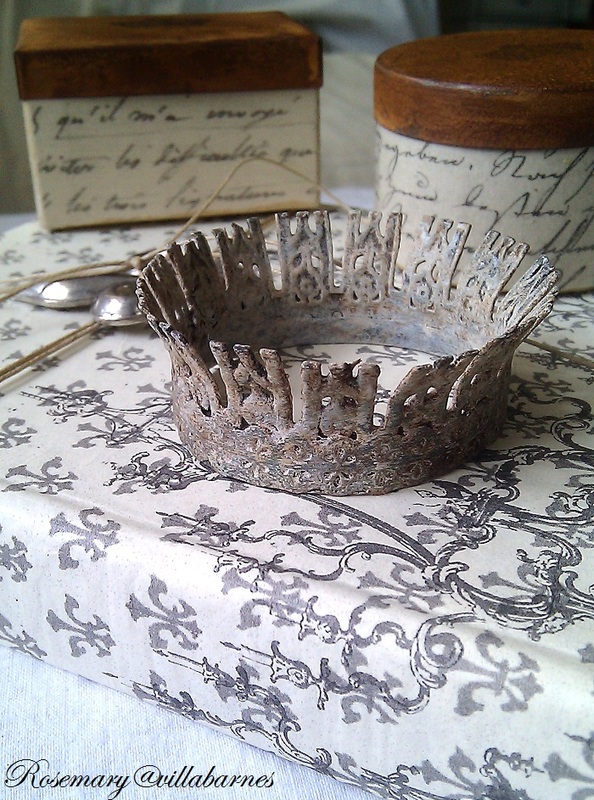 I am lusting for one of those small crowns...so thanks for the giveaway!! yes. I'm a follower. and yes. I'd like to be entered in your sweet giveaway. Hello...I have been following your blog for a few months (I follow a few other ones) and I very rarely make a comment...not that I don't enjoy/envy/love your work...it's just that I suffer from depression and other things. Your posts always give me something to smile about. I recently enjoyed the shots of your talented sons (the youngest one was being interviewed about a photograph he has entered in a contest and received first award for it and the other son was taking photos of him). This give-a-way you are holding is the first ever of such an event that I have tried to participate in. I live in a little run down trailer but I love all things French...especially that Eifell(sp) tower art picture you just recently framed in a blue toned frame. Anyways...I meant to just say that I would adore your give-a-way. And whoever wins it will surely treasure it. Warmly, Mary Stone (The Old Elf) P.S. I'm hoping one of my sons will soon be able to help me finacially move from this trailer (long story)and I hope to move to either a nicer apartment (meaning with a real kitchen) or a little cottage (GOD willing). 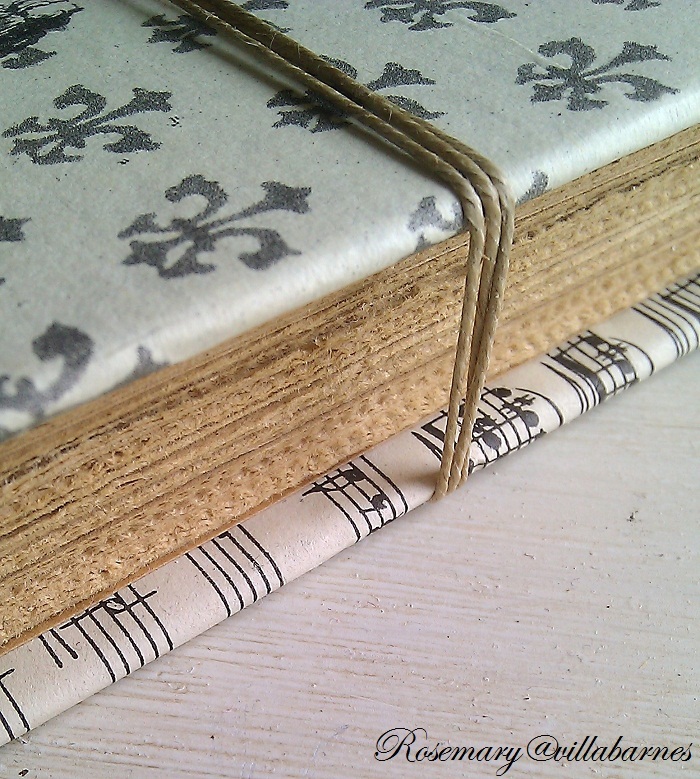 I am a follower of your blog and follow you on Etsy. Would love to win these awesome items! Hi Rosemary. What a generous give away. I am following you, but I am too far away to enter (all choked up), but I sure envy and feel overjoyed for the lucky person who wins these gems! I've been a delighted follower for quite some time. I adore your work but have not yet made a purchase. This set is gorgeous!! Thank you for your generosity!! Be especially blessed. I am a longtime follower and enjoy your blog. I love the beautiful and unique things you make. Im a new GFC fllower and I'd love to enter. And now I'm going to go stalk all those tutorials on your sidebar because they look gorgeous! 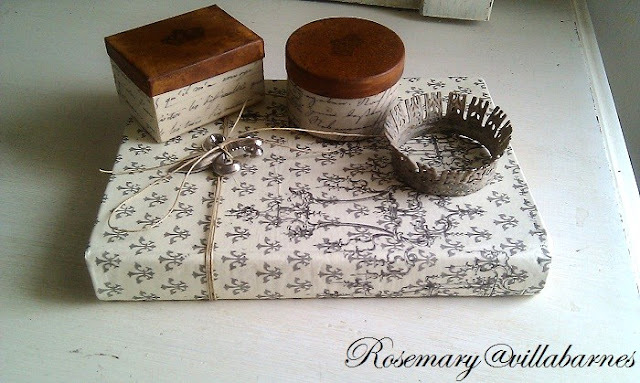 Rosemary- as a follower of your blog, happy to have a chance at winning your goodies. and now following your etsy shop, a favorite. Thanks again for the chance to win. what lovely offerings from your sweet heart! please count me in as i'm a long time follower!! oh, and i've purchased a few tings from etsy, a lovely old clay angel plaque that hangs in my bathroom, and a beautiful recycled piece of a table made into a rack you're so creative...love your work rosemary!! I have been reading your blog-it's bookmarked at the top of my blog list for about a year-but didn't know about following, so i just signed up. I love everything you do and those great tutorials! Comment 2-love your shop too! I have purchased Lime Rickey bottle caps, cardboard bobbins, faux flower bundles, two gorgeous cameo tags, and blue bonnet pearl buttons. You come up with some great finds. i am envious of the tag/estate sales that you attend. Things here in the NE are really picked over or outrageously expensive. I am still envying the garden statuary you found last year. Yes, I am already a follower and so glad I checked in in time for your give away. Thanks for the sweet offering to one of followers. Of course, I'm hoping that is me. Just discovered your lovely spot! Put my name in the pot for your giveaway! Oh! I'm a follower, Rosemary! Yes please I'd love to enter! Oh WOW! What a generous give away! I would LOVE to win these fabulous items, but I don't expect you would want to post to the UK. Love your blog and have been following you for a while anyway!